Make this healthy Indian roasted chicken or chicken curry recipe with very less effort. An excellent and yummiest way to add spinach to our diet. 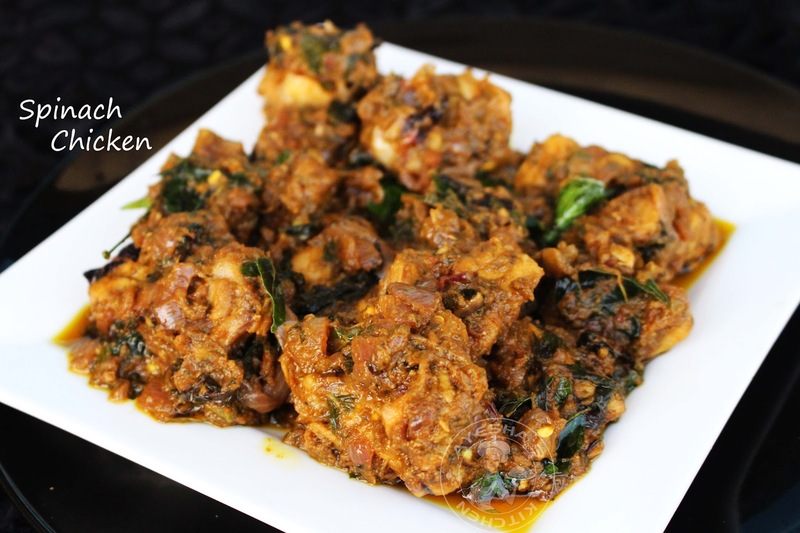 We have a wide collection of Indian spinach recipes. 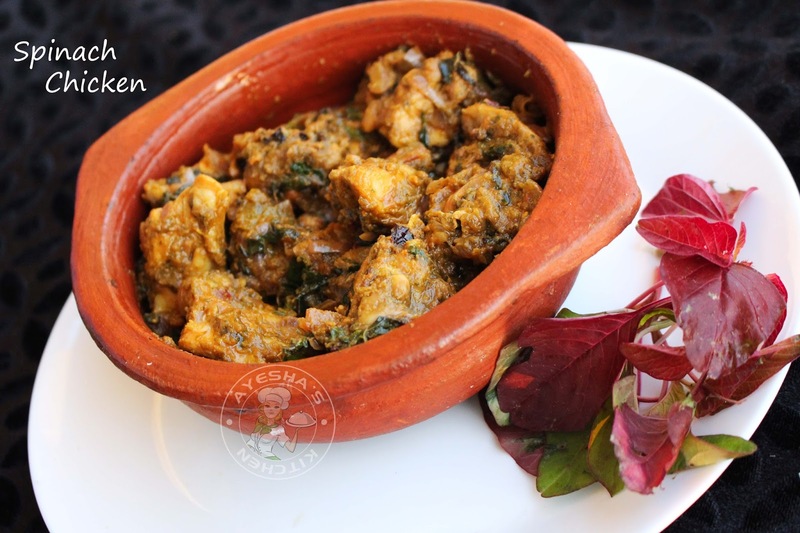 Spinach based curries are typically known as saag and so this is chicken saag recipe. Saag/Sag/saagwala is a leaf based dish which is often found in Indian restaurant menu. Though Lamb saag and Paneer saag are the most popular traditional dish in North India especially in Punjab, my favorite is saag chicken only. I love the spinach and chicken combo. We all have the habit to stick to things that are easy and comfortable. While in case of food, we will often stick towards effortless and tastiest recipes without even caring about the healthy version. This happens mainly because of our busy schedule and lack of time. So if you are aiming to cook healthy meals, this will be one of the most efficient ways for a tasty and yummy gravy. You can also make chicken dishes with palak leaves, mustard leaves and even with finely chopped broccoli instead of spinach. Recently, while browsing i have seen a recipe in Uae food bloggers group which inspired me to cook something healthy and easy that leads to this recipe. It is very difficult to include leafy vegetables in kids meal. Isn't it? For those who are facing the same problem, this recipe will give you a solution. You can add carrot paste, palak paste or any leafy vegetable paste instead of the spinach paste in this recipe. It will never affect the taste of the curry, instead, it will give you a thick yummy gravy. As a mom, i love to cook creative kids meal for feeding my picky eaters. This is an awesome chicken and spinach recipe. 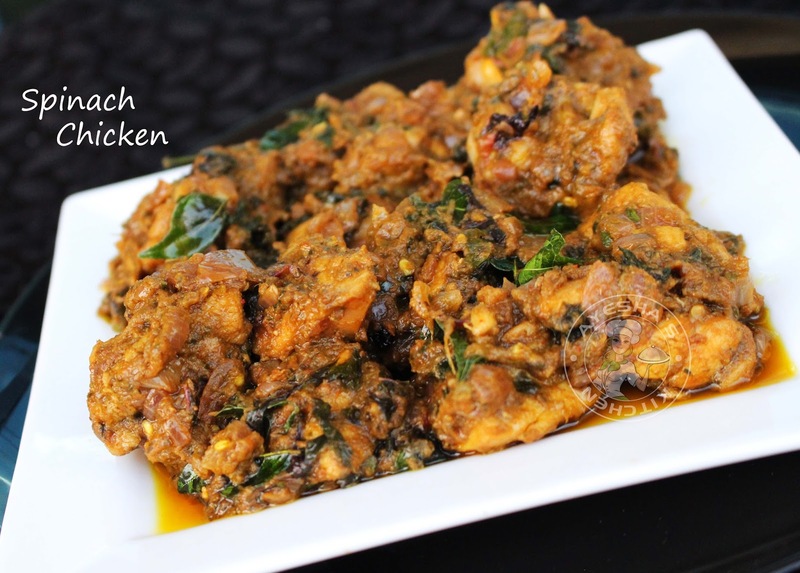 So Let's see how to make spinach chicken/chicken with spinach recipes/chicken spinach / Indian recipes chicken /easy spinach recipes for kids/spinach dinner recipes. Heat a pan with 2 tbsp of oil and saute the finely chopped onion and green chilies until soft. Meanwhile, make a thick paste of chopped tomato, ginger, garlic and fennel seed. Set it aside. No need of adding water while grinding. When the onion is done, add the tomato mixture along with chili powder, turmeric powder, coriander powder, garam masala powder, and salt. Combine very well and cook until the oil floats on the top. Then add the small chicken pieces and let it cook in the gravy for 3 minutes. Meanwhile, grind half a cup of chopped raw red spinach with little water and make a paste. Set aside half a cup of chopped spinach also. When chicken is half done, add the thick paste of spinach and cook until chicken is almost done. In between, add half a cup of chopped spinach to the gravy. Check for salt and cook until the gravy becomes thick and dry in consistency. Finally, you can season it with some fried onion (optional only). For that, heat a nonstick pan with two teaspoons of oil. Fry some chopped shallots or onion and curry leaves until golden and crispy. When done, pour this over the curry. It adds a very yummy flavor to all gravy or curry recipes (chicken/veg/ fish/mutton).